Earlier this month, for nearly two whole hours, I got to be 12 years old again. It was absolutely bloody brilliant and I can’t wait to do it again. Luckily I wasn’t *too* late to still get stuck in. The BMXercise session I joined is part of a series of events put on by Access Sport as part of its BMX Legacy Programme. 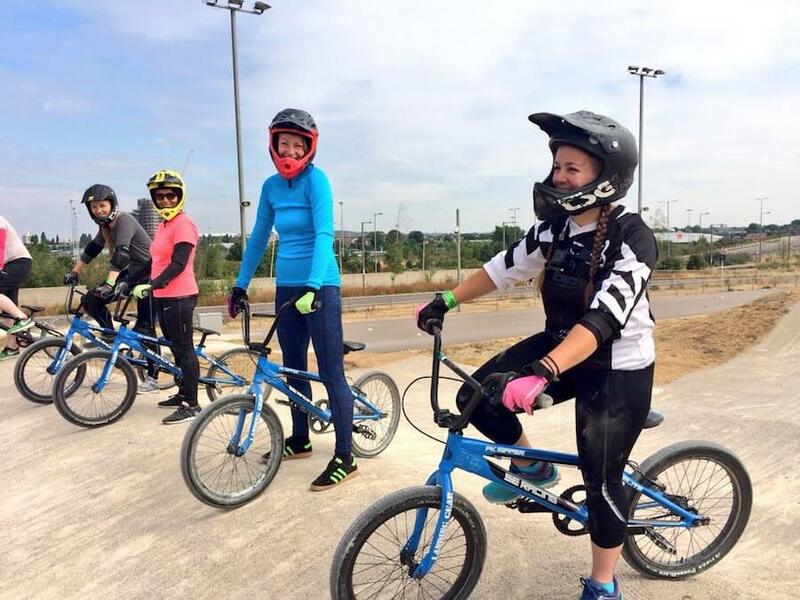 Following on from the success of the London 2012 Games, the programme offers low cost youth and women’s BMX sessions at tracks across London and now Bristol too, giving participants the chance to get fit, learn new bike skills, make new friends and gain confidence in a fun and inclusive setting. I was greeted by the lovely Harriet from Access Sport, who found me a full face helmet, bike and gloves to wear, all of which are available for hire at the VeloPark. This was to be my first experience of a full face helmet – and I’m not gonna lie, it did make me feel a little bit badass. Being a regular mountain biker, I see riders in full face get up all the time, but they’re usually doing the gnarly stuff I’m too scared to do, like the beasty black trails at Bike Park Wales and Forest of Dean. Which has got me thinking ahead to when my second full face helmet ride will be: back at Bike Park Wales next month for the Drop Zone course. It’s about time me and Chris stepped it up a gear to finally learn how to do drops properly, and what better way to spend our fourth wedding anniversary mastering the art? It’s all part of my summer cycling goals, and I promise not to come home with any broken bones this time. Ain’t nobody got time fo’ that! So anyway, there I was, face fully in said helmet, on a mega light racing BMX with just one brake (who knew? ), following Harriet out to the pump track. It’s the same track used for the London 2012 Olympics, but has been remodelled for public use so anyone can have a go, with the most notable change being the reduction of the starting ramp to a more public-friendly level (although I’d 100% LOVE to drop in on the Olympic one!). There were two groups – one beginner, and one intermediate. I used to ride BMX growing up and as a teenager so had ridden pump tracks before, and along with my mountain biking experience I decided to join the intermediate group. With BMX, it’s all about moving your body with the bike – so lots of pumping, leaning, and super-fast turns of the pedals when you get a chance to keep momentum. Pumping is a skill I need to master for mountain biking too so I was glad to get some practice. We started on the flat practicing pumping on the bike to turn side to side without pedalling – so a mini squat each time, sitting back and pushing your legs whilst turning the handlebars to change direction. Once we’d got pumping on the flat nailed we headed onto the starting ramp to have a go at dropping in and pumping up the first jump. It was at this point, when I got a real sense of how big the track actually was, seeing the height of the starting ramp and how tall the next one was, that I wondered if I’d been a bit overzealous of joining the intermediate group! The beginner group were practicing on lower parts of the track and on the flat just next to us. I’d ridden pump tracks before but never any this big, and I know from riding singletrack that the ups and downs can really throw you up into the air if you go fast enough, especially if there’s a lip on the ramps. We all took turns to drop in and before it was my go I was pretty nervous. It’s a thing I get with mountain biking when riding a new section or route. If I’ve never done something before, my body doesn’t know how it feels to do it, so I get scared. There’s still a few sections of singletrack in Wales and the Surrey Hills that I still ‘can’t’ do because my brain won’t let my body find out how it feels to do them. It’s a funny thing, fear, but something I work on with every ride. 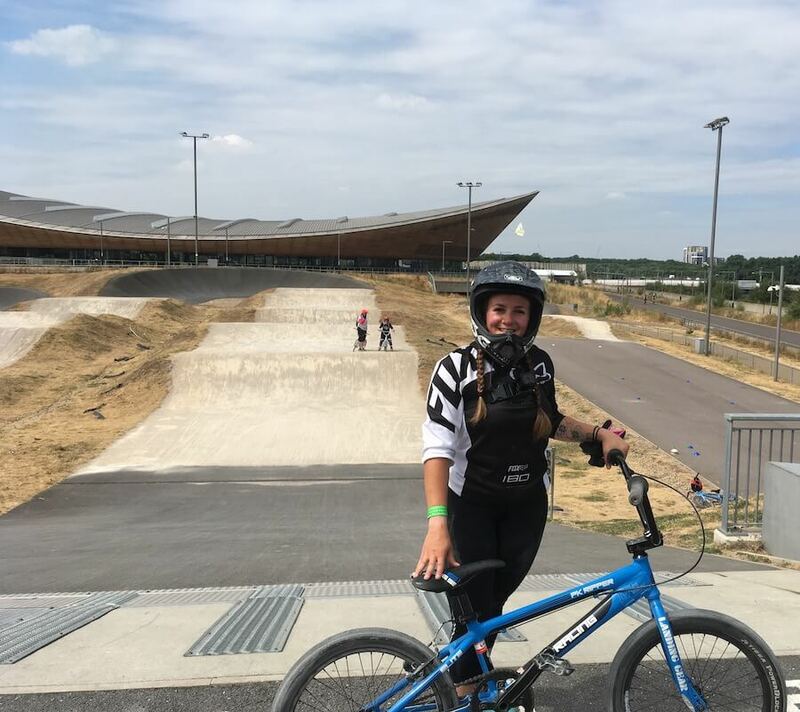 As soon as I rode down the BMX starting ramp and pumped up onto the first jump the fear soon went away, and after that, well – I felt like a kid again and couldn’t get enough of that track, not even when I stacked it after misjudging a landing on a little jump whilst everyone looked on! We took turns to drop in, pump to reach the top of the first ramp and turn around to pump as far back up the starting ramp as we could. The brilliant instructor Kelly was really good at explaining the best technique and how to move, suggesting to feather the brake on the way down (that means lightly touch the brakes on and off to slow you down), and pump at the bottom of the ramp to have enough oomph to get to the top. A few more practice runs to pump and keep momentum on the first few ramps and then we had the rest of the session to ride the whole track and learn how to ride off from the gates. This is where the fun really started. 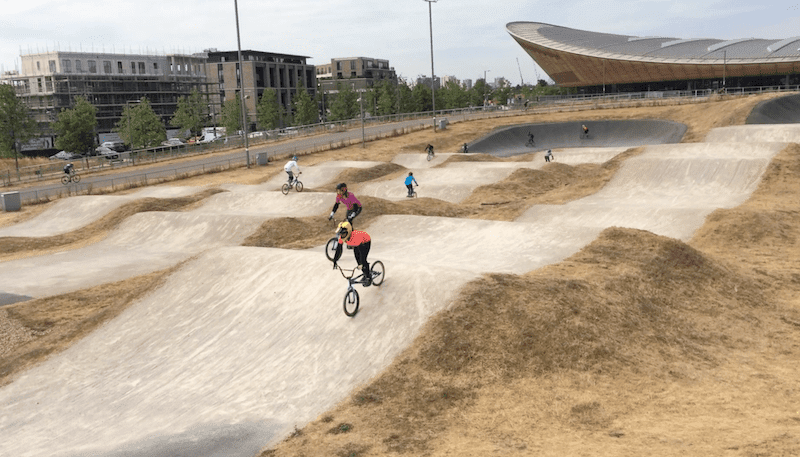 We went off in pairs and in threes around the track, learning tips on how to look after momentum to pump round and ride more efficiently on the berms. Some of us had a go on starting from the starting gates – which is brilliant by the way, and makes you feel like a proper badass BMX racer! I was thankful for all my trackstand practice I’ve been getting on the mountain bike as basically you need to push the bike up against the gate and stand on the pedals in a trackstand until it’s dropped and you can pedal off. The gate very handily talks to you and the traffic lights go from red to amber and then green when it’s time to go. I was too busy concentrating on staying up right to really push off from the gate so didn’t get the fast start but had the best time trying to catch up round the course. BMX racing always looks really fast on TV but I’ve got a new-found respect for just how fast it really is now that I’ve had a go myself and realise how important pumping, pedalling and body position on the bike is for keeping momentum and driving you forward around the track. It was a hot day and we all had to wear long sleeved tops as a requirement so I spent the rest of the session in a sweaty mess as I razzed around the track time and time again trying to master each section. I 100% want to do it again and am gutted I don’t live nearer because if I did you wouldn’t be able to keep me away! As far as I can tell we don’t have a BMX track in Brighton but I’ve seen a few Facebook groups trying to start clubs and build one so will keep an ear out for news. I’m gonna bring Chris up to the VeloPark track so he can have a go too, maybe after we do our Velodrome track taster for double the fun! 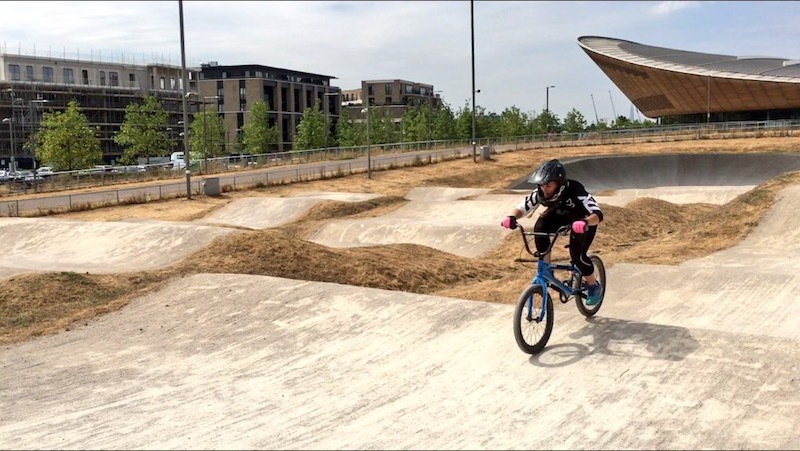 BMX bikes and kit are available for hire from the Park and you can join any of the skills sessions on weekends throughout the year from beginner basics right through to manuals, jumping and more advanced racing skills. 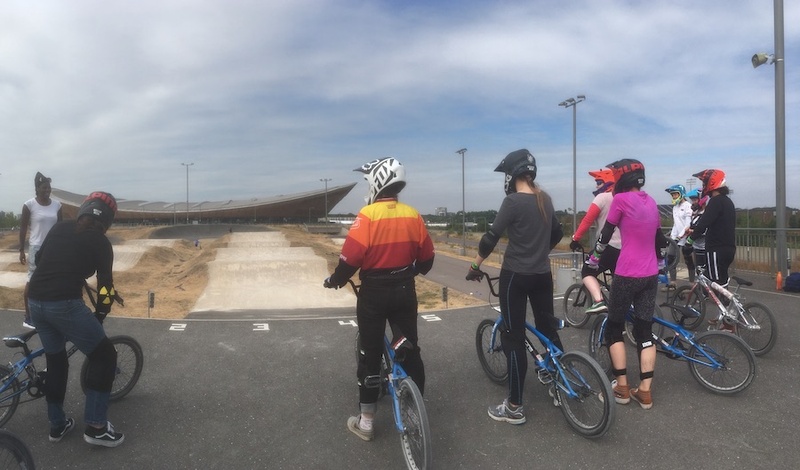 The BMXercise sessions run are women-specific and fitness focussed, running throughout the year at different tracks around London and Bristol. They’re geared up for beginners so if you’ve never ridden before don’t be afraid to just turn up. I promise that whatever level you are, as soon as you get on that track you’ll have the best time! 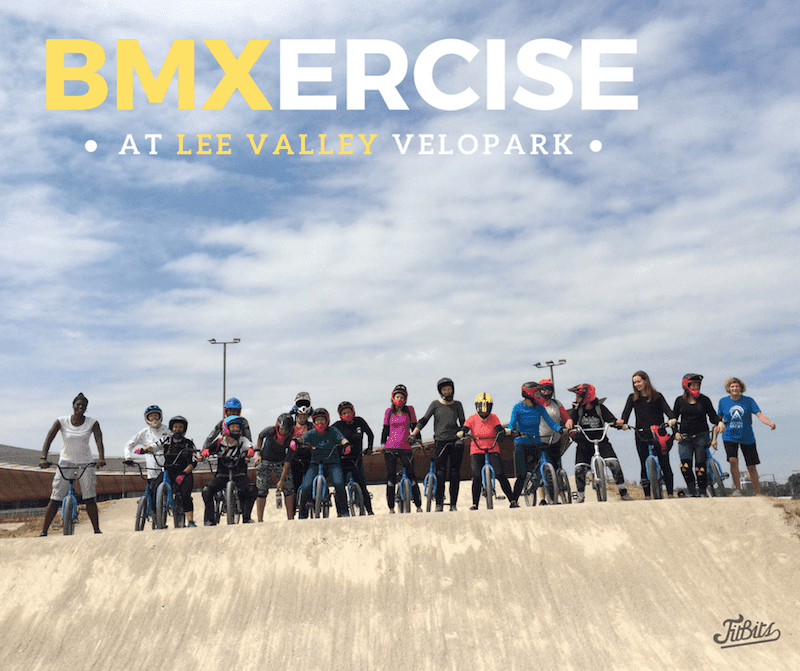 Find out more about BMXercise on the Active Sport website and all the bike-shaped fun available at Lee Valley VeloPark. *This post was not in collaboration with BMXercise – I paid (a very affordable price) for my place on this session and loved every minute! VIDEO: What do the women of Brighton love about cycling? Next Post An Isle of Purbeck mtb adventure!